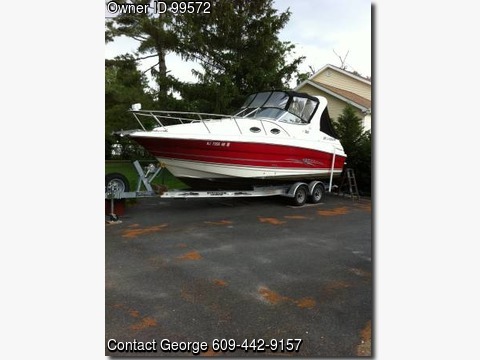 Boat is located in Mays Landing,New Jersey.Please contact the owner @ 609-442-9157 or smith_1813@yahoo.com…Selling my 2008 26′ Larson Cabrio. This boat is in like new condition and still has that “new”smell in the cabin. It’s powered by a 5.7 liter 320 hp Volvo Penta engine with only 102 hours on it. The cabin sleeps 4 and has a reverse cycle air conditioner/ heat unit with a full head with vacu-flush toilet, stand-up shower, galley with two burner cooktop, dual power refrigerator, microwave, coffee maker and sink. Therein also a stereo, DVD player,tand TV in the cabin. Included in the price is an aluminum I-beam dual axle trailer.